The latest edition of Manfest-Varchasva, IIM Lucknow’s annual Business, Cultural and Sports festival took place between 17th -19th November, with Azure Power as its title sponsor. Manfest-Varchasva and Azure Power, an independent power producer, developer and operator of utility and commercial-scale solar PV power plants in India, joined hands to launch Stratathon, a strategy competition with a live business problem from the solar power industry. Azure power is the pioneer in the field of utility-scale solar power generation in India and was founded in 2008 by Inderpreet Wadhwa with the aim of providing affordable and clean power for generations to come. Azure Power’s 2 MW Punjab facility was the first utility-scale solar power plant in India in 2009. The project provides electricity to 32 villages with over 20,000 people in Awan, Punjab. Azure Power also successfully commissioned India’s first MW scale rooftop solar power Project in Gandhinagar, Gujarat in 2013. In a short span of time, the company has become an indispensable part of India’s renewable energy revolution and established a tremendous track record for itself through its integrated business model, and its sharp focus on time-bound execution. Azure Power became the first Indian renewable energy company to get listed on the New York Stock Exchange in October 2016. In August, Azure Power raised $500 million by selling green bonds, the first company in the country to do the same. With the government exerting great thrust on solar power and setting a target of 100 GigaWatts of solar power generation by the year 2022, the path in front of Azure Power is filled with challenges, promises and successes. Azure Power’s success is tied to the communities they serve, and they are firm believers of inclusive growth for the communities where they build projects. Azure Power prefers to hire and train staff locally and lease land from communities. The jobs and discretionary cash flow that these projects create for communities, which are often in remote locations, foster support for these projects and growth for the local communities. The case competition in association with Azure Power was aimed at putting the best minds of our nation to work on a project that might change India’s renewable energy landscape and transform the lives of millions. With a tentative budget of 5 crores, the finalists were challenged to device a full-fledged business solution to set up microgrids in rural India. Microgrids or isolated grids are a set of electricity generators and possibly energy storage systems that are interconnected to a distribution network that supplies electricity to a localized group of customers. They involve small-scale electricity generation (approximately 10 kW) which serves a limited number of consumers via a distribution grid that can operate in isolation from national electricity transmission networks. While solving the case, the participants must also consider the real-life constraints faced in execution like land acquisition for setting up the grid, operations and maintenance for the rest of the life of the mini-grid plant, overloading and misuse of electricity, reluctance of allowing the village land to be used and consuming electricity, problems of power theft and how to empower every villager not to follow power theft practice etc. With prizes, worth INR 85,000 for the winning teams, over 400 teams from B-Schools across the country registered to participate in the case competition. 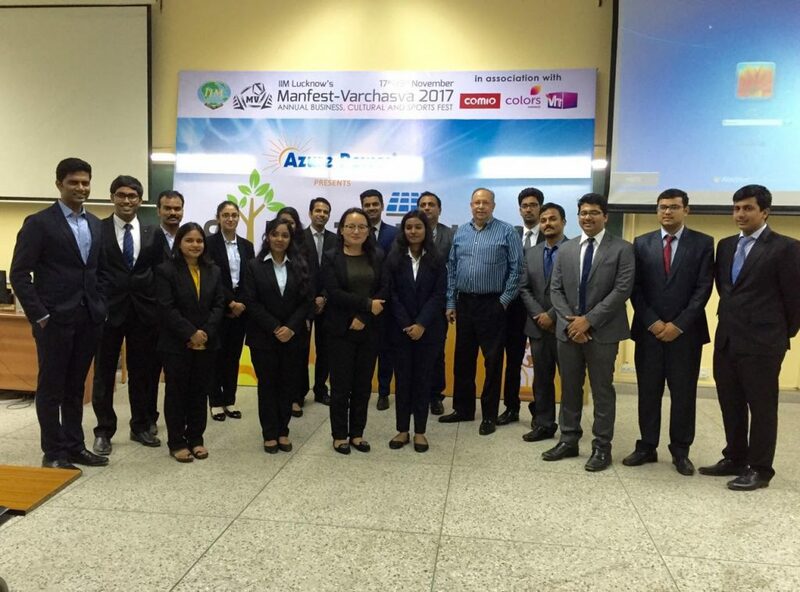 After two gruelling rounds consisting of an online simulation and an off-campus case study, eight finalist teams were invited to the campus to present their case solutions to the judging panel during Manfest-Varchasva 2017. The judging panel consisted of Mr Mohor Sen, Chief Administrative Officer of Azure Powers, Ms Samitla Subba, General Manager – Marketing and Communication of Azure Power and Mr Sanjay Khosla. Team SP Crew, from S. P. Jain Institute of Management and Research, consisting of Mr.Subrat Sharma and Mr.Mayank Singh emerged winners, while Team CM208, from MDI Gurgaon, consisting of Mr. Shailav Goel and Mr. Garvit Sindhwani came second. The successful collaboration between Azure Power and Manfest-Varchasva ended up in a beneficial outcome for the renewable energy sector of our country. It also aided in introducing the budding leaders of tomorrow to a sector that is fast growing in our country and that holds limitless potential and challenges in the years to come. We wish Azure Power all the best in all its future endeavors and eagerly look forward to all further avenues of collaboration with the company.